This page has been updated to reflect DirecTV Now supporting Roku streaming boxes, the addition of Fox Local Channel 8 to their channel offerings in Fairlawn and a cloud DVR. 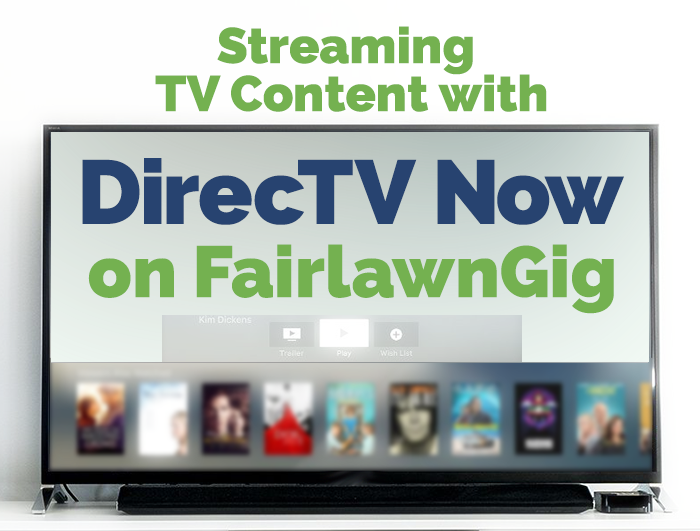 DirecTV Now, AT&T’s entry into the TV content streaming service market, works great with FairlawnGig’s fast and reliable fiber Internet service. You can watch live sports, get on-demand entertainment and enjoy premium paid TV channels—all streamed over the Internet without traditional cable or satellite TV services. FairlawnGig does not endorse any particular streaming service, but we’re offering our “Cutting the Cable Cord” series to help you navigate this new and changing landscape and make the best decision for your household. An area resident who recently cut the cord and signed up for DirecTV Now helps us sort out the pros and cons, and the quirks of how to get it to work best for FairlawnGig users in Fairlawn. DirecTV Now is a TV content streaming service owned by AT&T, an alternative to DirecTV satellite service. Separate from DirecTV, DirecTV Now is focused exclusively on streaming video over the Internet. DirecTV Now has four plans that offer much of the same content that you would get from a cable TV or satellite subscription. The DirecTV now packages are like a safety net for people switching from cable to streaming. While you are exploring the new world of streaming, you get a package with most of the cable channels that you care about and is much less expensive than cable or satellite. There is a promotion now where you can get the Go Big package, which includes over 100 channels, for $60 a month. We went for the Go Big promotion and added HBO at $5 extra for a total of $65 a month. Stream DirecTV Now content to your TV through a number of devices including Chromecast, Apple TV, Amazon Fire TV, many Smart TVs and mobile devices including newer iOS and Android smartphones and tablets. Roku set-top boxes are now supported also. Mobile devices stream DirecTV Now using an app, and computers are supported by viewing through a web browser. As a new service, DirecTV Now is running a promotion where they will supply an AppleTV or Amazon Fire TV Stick if you pre-pay for a few months of service. We have been testing the AppleTV and DirecTV Now combination. DirecTV Now is one of the apps installed on our AppleTV. 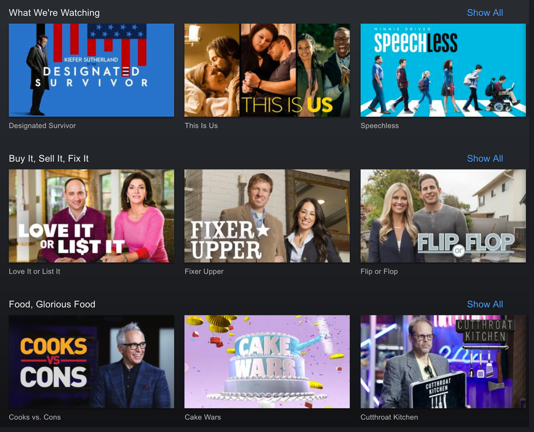 When you run the DirecTV Now app, you will see the home screen which has a window of live TV from the last channel you were watching along with a menu of viewing options: Shows, Movies, Networks, Search, Guide. Shows is a way to browse video on-demand for TV shows that are part of your package. How much video is available with on-demand content varies from show to show. In one case, every episode of Designated Surviver was available for streaming. Other shows may have some limitations. For example, Flip or Flop had the three previous episodes of the current season, but did not have the latest episode which is still airing on live TV. Even with the restrictions on some channels, there is a tremendous amount video on-demand content available. 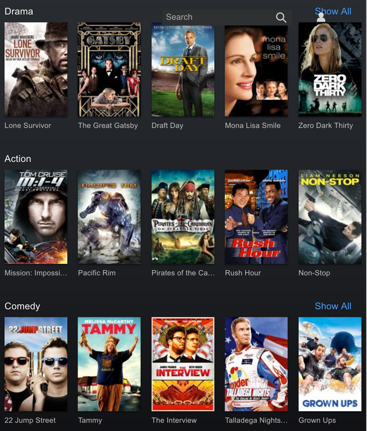 Movies is a way to browse all the movies that are available from the different channels and networks in your package. There are a lot of great movies available. Networks is a another way to browse through both video on demand and live content. Guide is for Live TV. It’s a transparent overlay over your live TV, which you can play in the background. Guide is very familiar to cable TV or satellite users. It is simple and works exactly as you would expect. How does DirecTV Now work for the local Fairlawn audience? The main concern with a package like DirecTV Now is local content for sports and news. What content is available and what other steps do you need to take to get your local content? The Go Big package includes Fox Sports Network which carries Fox Sports Ohio in our area. So watching Cavaliers games live is no problem. For most Cavs games there is more than one feed that you can watch—Fox Sports Ohio, NBA TV, and sometimes TNT. Other live sports and news is limited. You get live national news and sports through CNN, BBC World News, ESPN, Fox News, Fox Sports, CNBC, etc. The big networks are limited in our area: CBS is unavailable on DirecTV now. NBC and ABC are available, but limited. There is no local content on these channels in our area. Local Fox channel 8 is now available on DirecTV Now in Fairlawn. DirecTV Now has local channels for NBC stations that are owned by the network, but WKYC, the Cleveland NBC station is not one of them. This is something that will change over time. More local content will be available. For now, the best option for local channels is an over-the-air HD antenna. CBS does not seem to be working with the streaming providers. CBS offers an app for AppleTV that costs $6 a month. It has all the CBS network content live and on-demand for past episodes and seasons. They are even creating premium content for streaming that would compete with HBO or Netflix. CBS does offer Channel 19 WOIO in Cleveland. We are getting all our local channels now with an indoor antenna. You don’t need a “whole home TV system”. DirecTV Now streams from your home router direct to your TV, mobile device or computer. You can start watching a program on the main TV and switch to your tablet half way through. It is very convenient and works great with the FairlawnGig ONT. DirecTV Now saves the channel you were watching when you stop, and will resume where you left off the next time you turn it on. You can use your DirecTV Now login credentials to access mobile apps and network sites for ABC, Disney, WatchESPN, Freeform, HBO GO, MAX GO, NBC Golf, NBC sports. Coming in late 2017, a launching of their cloud DVR for recording content and a new parental control feature. DirecTV Now does not currently offer enough local content. You’ll need an antenna to watch live local channels for news and sports. We have seen more commercials in the past few weeks than we have for years. There is some limited pausing, fast-forwarding and rewinding options. However, these capabilities vary with the content you are watching. DirecTV Now is a new service. Some of the menus are confusing and it takes awhile to get used to. Our newbie streamer resident stopped their satellite service, which was $190 for a premium package of channels and HBO as well as equipment fees. They are streaming everything now. While it is not perfect, they are getting most of the same content they had before and have access to a bunch more content. 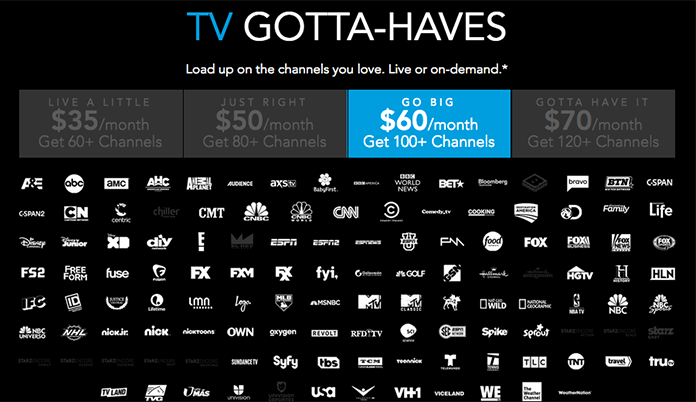 Their monthly cost is now down to a total of $71—$60 for the DirecTV Now Go Big Package, $5 for HBO GO, $6 for CBS. With $119 in cost savings per month, they can afford to spend a little money on the fanciest over-the-air antenna and figure out an add-on DVR solution. It’s important to note that streaming services are relatively new compared to cable, and DirecTV Now only debuted last fall. The system will be tweaked and improved on over time. Look for a DVR alternative in the future, such as a cloud-based DVR option to record live programs. There are also other similar services: read our article on SlingTV. Being educated on streaming services will help you make the best choice that will work for your household. Streaming TV content over the Internet is no longer in the future: it is here now, and how content will be delivered, which is why cable companies are offering streaming services. FairlawnGig’s fast and reliable network is tailor-made for optimal streaming. Anyone with a FairlawnGig service package of 100 Mbps or above will be delighted with the streaming performance in their home. You can sign up for FairlawnGig Internet service here.